Selfpac3D a one-stop portal providing self-paced learning resources to everything in the 3D world, including 3D modeling software, 3D scanning and 3D printing technologies. Certified SolidWorks Associate (CSWA) Preparation Course, is a self-paced learning course that prepares participants to confidently take and pass the CSWA certification exam. Participants of this course will learn the essential skills in SolidWorks 3D design software, required to handle the CSWA certification exam. This course is originally a classroom-based, instructor-led course that prepared hundreds of students for the CSWA exam. This tried-and-tested course, is now available as a self-paced online course, so that more students can benefit from it, at a fraction of the cost. This course not only provides you with high quality content, taught by certified experts, it also leads into industry recognized certification, the Certified SolidWorks Associate (CSWA) certification. Please note that, this is NOT A BEGINNER’S course. Before taking this course, you should already have a basic understanding of 3D parametric modeling in SolidWorks. You should already know how to model basic parts, assemblies and drawings in SolidWorks. 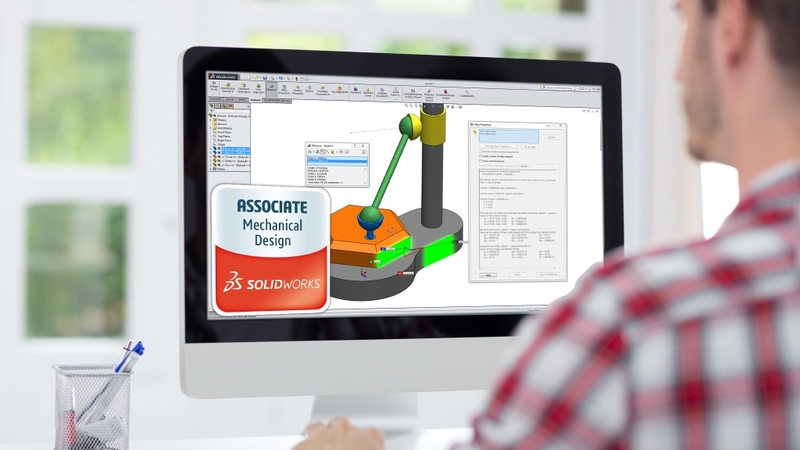 Participants that wish to learn foundations of SolidWorks, may sign-up for another course on Selfpac3D, Becoming a Certified SolidWorks Associate for Beginners. SolidWorks 3D design software is a widely adopted, and the best-in-class 3D computer aided design (CAD) software, that is used in design, engineering, research and education fields. Whether you are an industry professional, wanting to become more productive in 3D design and manufacturing; or a student, who wants to pick up industry-relevant skills, and be more employable; or a hobbyist, who wants to realize your creative ideas for 3D printing and other prototyping technologies, this course, is for you. This course not only provides tried and tested training methodology in 3D CAD/CAM/CAE technologies, it guides you in attaining an industry recognized certification – the Certified SolidWorks Associate (CSWA). The Certified SolidWorks Associate (CSWA) Preparation Course, is originally, a 10-hour instructor-led training programme, that has been converted into a self-paced learning course, with the objective of making it Affordable, Accessible, and Value-Adding to learners. This course is developed and taught by Chevy Kok, a Certified SolidWorks Instructor, who has directly trained and certified hundreds of students, in physical, instructor-led courses. You have the guarantee that you are learning from the best in the field! Self-paced learning (anytime, anywhere learning). Skills-based practice questions, that closely mirrors the requirements of the exam. Access course materials on Udemy website or iOS and Android apps. Blend of video instruction, quiz questions, and hands-on practice exercises. Learn on the latest version of the SolidWorks 2015 software.. Periodic course updates with practice exercises. Why am I going to get from this course? Over 28 lectures and 2.5 hours of content! Confidently attempt the Certified SolidWorks Associate (CSWA) certification exam. Understand how to purchase the CSWA Certification Exam. Access information related to the SolidWorks Certification Center, such as, downloading of certificates, reviewing exam results, and access the certified user directory. Confidently navigate through the Tangix Tester Pro Client, for taking SolidWorks Certification Exam. Identify different drawing views available for part and assembly drawings. Handle basic part modelling questions in the CSWA exam. Handle intermediate part modeling questions in the CSWA exam. Handle basic assembly modeling questions in the CSWA exam. Apply different materials to part models, and evaluate the model’s mass properties. Create custom coordinate systems and evaluate the model’s location of center of mass. Edit and modify part and assembly design, to maintain design intent. You need access to SolidWork Standard, Professional or Premium software. The course is conducted in the SolidWorks 2015 version. PC with an internet connection to view the video lectures. For mobile learning, a Tablet of Smartphone with supported web browser (Chrome or Safari). Full-time students and educators, may qualify for the SolidWorks Education Edition. Please get in touch and we will advise accordingly. Training files provided are compatible with SolidWorks 2012 and above. Mr. Chevy Kok has done it again. Another GREAT SolidWorks course. 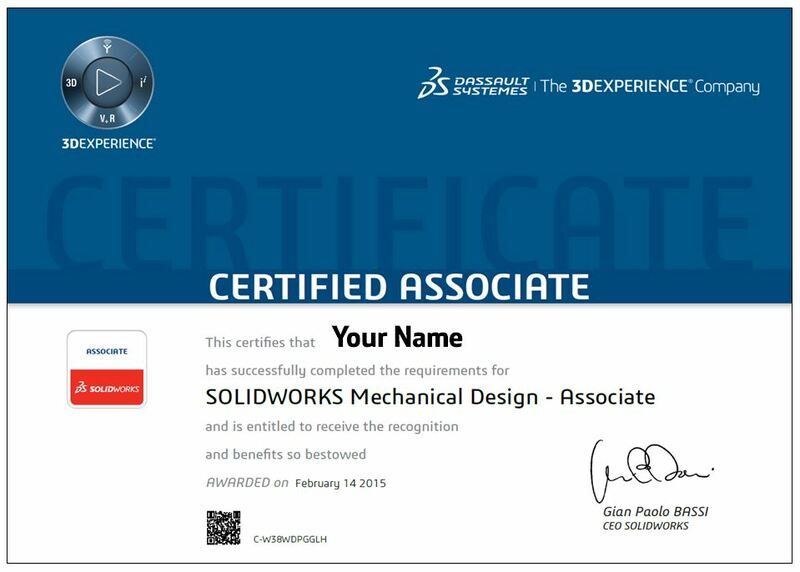 I would definitely recommend it to anyone who is serious about learning SolidWorks and getting their CSWA. I have now gone through both of Mr. Chevy Kok’s SolidWorks courses and I have just taken the CSWA exam and I passed all because of this professor’s courses! Outstanding! I highly recommend this professor and both of his courses. You cannot beat the training that you will get from this professor. He is tops! I am so excited to have gotten my CSWA!! This is a very good course to prepare for CSWA. The teacher (Chevy kok) have a good skill in teaching Solid Works and you can see he enjoys teaching. I am very happy. Thanks. This course gives me the functional practice of the knowledge. I passed the CSWA without any of missed points. Thank you so mutch, Chevy! I can waint for your next course! The instructor gave all the detail required to approach the CSWA exam, including how to register for and start the test. The exercises were very much similar to those that were asked in the exam. The delivery was also good, keeping the listener interested.